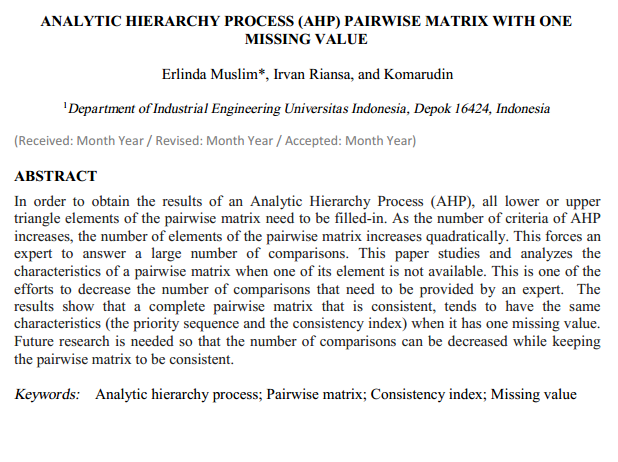 In order to obtain the results of an Analytic Hierarchy Process (AHP), all of the lower or upper triangle elements of the pairwise matrix need to be filled in. As the number of criteria of an AHP increases, the number of elements of the pairwise matrix increases quadratically. This forces an expert to answer a large number of comparisons. This paper studies and analyzes the characteristics of a pairwise matrix when one of its elements is not available. This is one of the efforts to reduce the number of comparisons that need to be provided by an expert. The results show that a complete pairwise matrix that is consistent tends to have the same characteristics (priority sequence and consistency index) as when it has one missing value. Further research is needed so that the number of comparisons can be decreased while still keeping the pairwise matrix consistent. The current paper studies the effects of an incomplete pairwise comparison matrix in an AHP. The study shows that the more consistent a pairwise matrix, the greater the tendency for it to retain its consistency even when one element is missing. This would suggest that the AHP method can be carried out without filling out the entire pairwise comparison matrix, but with one or more missing values. One method that warrants consideration in future research is the approach used to approximate the missing value. In this study, the calculation of Eigenvectors for the pairwise comparison matrix is considered to be missing. It is expected that an approximation of the missing value can enhance the value of the retained percentage of the consistency ratio. This study was financially supported by Hibah PITTA 2017 from the Directorate of Research and Community Engagement, Universitas Indonesia.